My frequent visits to Etsy uncover so much unique, one-of-a-kind hand-made stuff. One of these I would consider a treasure. I have a *cough* slight obsession with giraffes, so a search for the keyword "giraffe" happens on at least a monthly basis in my search to accrue as many giraffe items as possible. 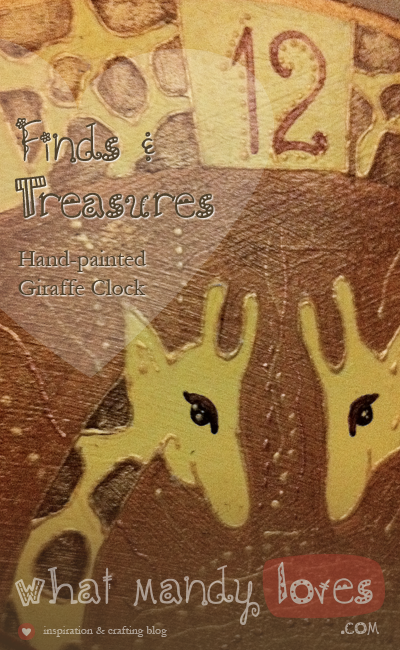 This hand-painted wall clock was found on the ArtClock shop and oh how I adore it so! 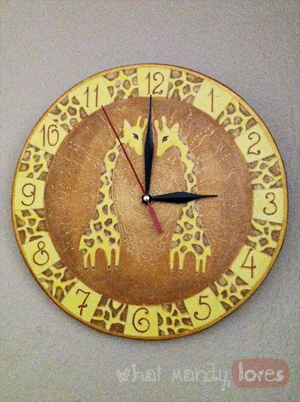 The coloring, the cute giraffes smirking at you oh so subtly, and the detailing of the entire thing made this clock and all the other clocks on this lady's shop stand out. The clock mechanism attached to the painted wood is really quiet and doesn't call attention away from the design behind it (or enough contrast to show the time). It's 25cm in diameter and hangs up easy. AND it was made all the way in the Ukraine! Talk about extra fancy! "Oh, where'd you get that clock?" THE UKRAINE, I'd say as if I have been there haha. If you're looking for a unique clock, I highly recommend Anna Gaponova's ArtClock shop. 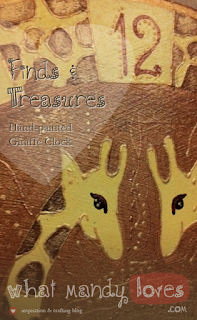 All her pieces are gorgeous including this giraffe one I am so happy to have in my home. I only wish I could get a desk clock version for my desk at work.